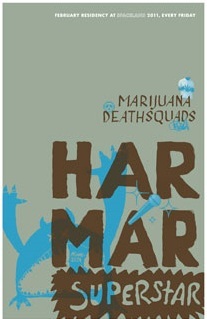 This just in via the Modern Radio message board: Marijuana Deathsquads have joined forces with Har Mar Superstar for a monthlong residency at L.A.'s Club Spaceland. It's no big shocker, being that Marijuana Deathsquads collaborator P.O.S. has been recording in L.A. over the past month, Har Mar calls L.A. home these days, and Har Mar and GAYNGS are regular collaborators. They will play every Friday in February.